Victoria O’Neill gave up being a librarian when she discovered she could cook for a living. After training at the Cordon Bleu in London she has cooked professionally all over Britain, Italy, America, and back in her native Australia where in 1982 she started Cooking with Class in Sydney. 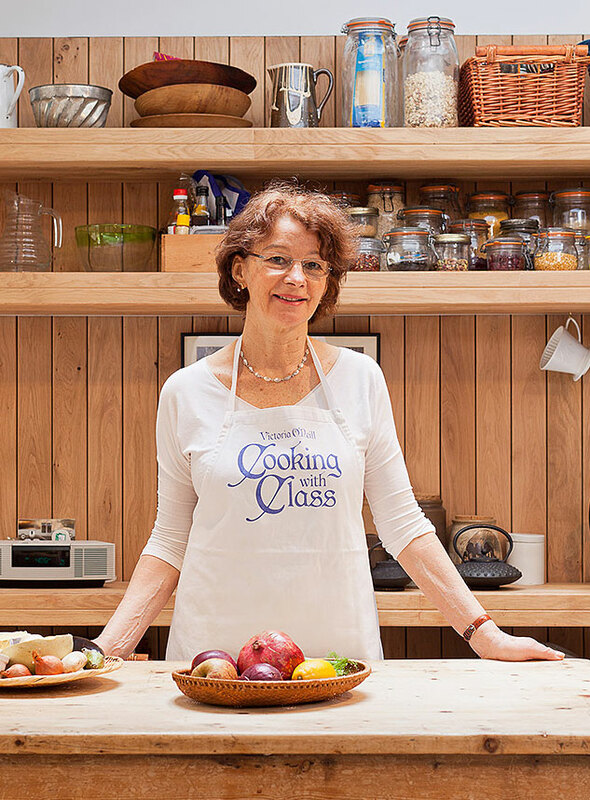 Moving to London in 2013, after many years in Oxford and Hereford, it’s here in her own kitchen, that Victoria teaches students to cook and improve their culinary skills. Her emphasis has always been on using ingredients that are easy to find and of the best possible quality, something London does well with all its markets and small shops, not to mention diverse and demanding customers. She is a perfectionist in the kitchen but is equally aware that people’s lifestyles today leave them thinking they have little time to cook. She tackles this problem in every class with ideas for quick meals and a passion not to compromise on quality or flavour. Stylish simple recipes are taught along with essential cooking techniques and organisational skills. By offering small classes where everyone is participating in the preparation and cooking, Victoria believes this is the quickest way to gain skills and confidence in the kitchen. Working towards a meal and then sitting down and enjoying the food cooked makes a convivial ending to an enjoyable learning experience. Victoria is very happy to arrange special “one-off” classes – these could be one-to-one practical tuition, a hands-on class for a small group of friends or colleagues, or demonstrations for groups of up to eight people. If you would like a corporate cooking class event, please email to discuss what you have in mind.